Hampshire Wasp Control - Areas we service. Hampshire Wasp Control Currently consists of four Pest Controllers located in strategic areas of Hampshire, Wiltshire and Surrey. If you have a problem, we can get rid of wasps or hornets the very same day as you call us. Paul Sweet and Phil Lloyd both specialise in Wasp Control in the summer months and mole catching during Autumn, Winter and Spring. Paul specialises in two critical areas of wildlife management these include Wasp & Hornet nest treatments during the summer months and mole catching throughout autumn and winter. Paul's main area covers: Bagshot Camberley Camberley-GU16 Camberley-GU17 Farnham Farnham-GU10 Lightwater Sandhurst Salisbury Salisbury-SP2 Salisbury-SP4 Salisbury-SP5 Tidworth Aldershot Aldershot-GU12 Fleet-GU13 Alton Bordon Farnborough Fleet Fleet-GU52 Yateley Basingstoke Basingstoke-RG22 Basingstoke-RG23 Basingstoke-RG24 Basingstoke-RG25 Hook-RG27 Tadley Whitchurch Odiham Alresford Eastleigh Romsey Romsey-SO52 Eastleigh-SO53 Stockbridge Winchester Winchester-SO22 Winchester-SO23 Andover Andover-SP11 Highclere and all areas in between. If you are unsure if we cover your area, either give us a quick call or please use our postcode search to find out if we cover your area. Phil has been a pest controller in the Hampshire area for over 30 years and has a vast amount of experience in treating Wasp and Hornet nests. He also controls Moles and other Rural Pests in the Winter months. Please use our postcode search to find out if we cover your area. The South West Hampshire area covers: Portswood, Rownhams, Totton, Hythe, Fawley, Lymington, Lyndhurst, Brockenhurst, Milford On Sea, New Milton, Bransgore, Christchurch, Ferndown, Westmoors, Verwoode, Ringwood, Fordingbridge, Downton, Cranbourne, Rockbourne, Hurn, Throop, West Parley, Sopley and Burley and all areas in between. The Berkshire/East Surrey area covers: Slough, Windsor, Bracknell, Chobham, Staines-upon-Thames, Walton-upon-Thames, Wokingham, Esher, Woking, Epsom, Banstead, Leatherhead, Reigate, Guildford, Smallfield, Crawley, Horsham and Burgess Hill and all areas in between. Note: the areas on the map are just an approximation of our coverage. If you are unsure if we cover your area, either phone us to discuss or use our postcode search facility. If you have a problem and need to get rid of wasps fast, then give us a call! Please be aware: although in some cases it may be necessary to remove a wasp nest that is in a position where it is blocking an entrance or similar situation, in general, it is not required to remove wasp nests after treatment. Each spring, queens which have hibernated through winter, wake up and start a brand new nest. In the unlikely event that you have a nest that requires removal after treatment, we can provide a wasp nest removal service. 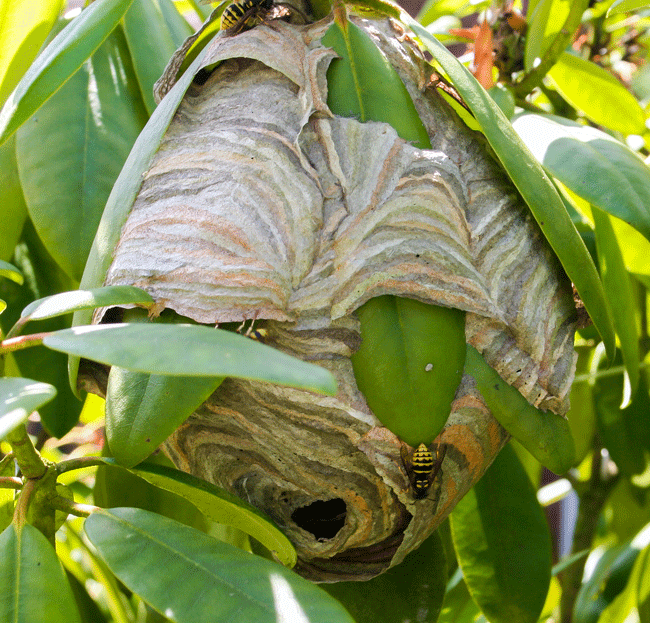 Once treated, all occupants of a nest are destroyed and the nest will quickly become inactive (usually by the end of the day when all foraging wasps have returned to the nest).